This is a regular blog post. Show notes and links to show audio appear in the other entries. 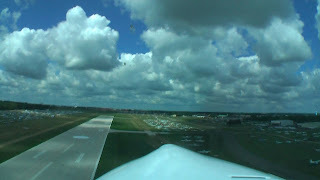 I’m still unpacking and sorting the audio and video that I captures at AirVenture Oshkosh last week. An amazing amount of content in a week! In addition to the Cessna Citation Mustang flight, I got my first flight in a light sport aircraft (“LSA”), namely the Remos GX. As with other experiences at Oshkosh, I’m going to be awhile in putting together the episodes so that I can devote reasonable attention to them. But I wanted to get some frame grabs up to when your appetite. Here’s the departure from KOSH. Here’s the one drawback to using the 0.3 semi-fisheye lens. You can’t really pick out the six or so other aircraft visible through the windshield. 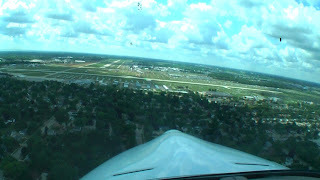 We took off in the hairball that is the usual departure scheme for KOSH during AirVenture. It should be more obvious in the video episode, where movement will show you the other aircraft. Steep turns over some farmland about eight miles north of KOSH. 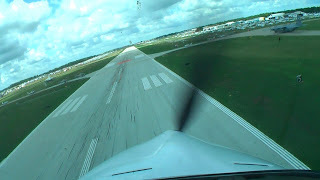 The approach back in to KOSH. Eyeballs outside and bracketing airspeed aggressively. Just prior to touchdown. We asked for the orange dot and got it. Then left a little tire rubber right on top of it. Great control on the landing. At which point the demo pilot said “my airplane” and proceeded to deftly demonstrate slow flight and a gorgeous stall all the way into a falling leaf. 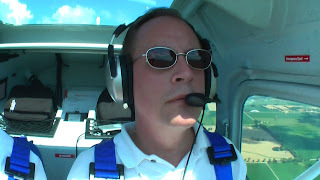 Being that the demo pilot’s briefing stated that the flight controls his with no quibbling whenever he asked for them or took them, I took it to mean that demo riders wouldn’t be allowed to stall the airplane. A little disappointing, so I told him that I was done and that we could head back. After talking to some of the other demo riders, I found out that others got to fly the stalls and other maneuvers, so it apparently wasn’t policy. And it could simply have been a miscommunication with the demo pilot. 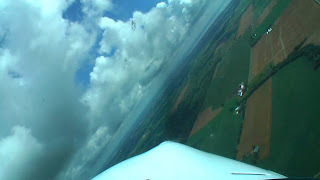 In any case, I’m going to invite a couple of the other demo riders onto the audio episode so that you guys get a full first-hand account of what it’s like to fly the aircraft through a little more of the envelope than I did. Stay subscribed! Cool stuff coming!